Bad Day at Black Rock (1955) is both a tightly-written, suspenseful, dramatic action film (with film noirish qualities) and a western. On the surface, this American film classic is concerned with the themes of individual integrity, group conformity and complacency, and civic responsibility. It can also be seen as a powerful, allegorical indictment of the Hollywood blacklist, created during the climate of suspicion and fear of the 1950s McCarthy era. The message of director John Sturges' taut and influential film can be interpreted with different levels of meaning, but predominantly as the tense portrayal of a one-armed stranger who intrusively has arrived in a half-forgotten desert town filled with ruffians. Over a twenty-four hour period, he finds himself unwelcome and facing several ominous characters, animosity, collective guilt, hypocrisy, and bigotry. The film builds suspense by withholding information about the visitor's mysterious mission, and by creating a who-dun-it mystery regarding the hostile town's secret. Eventually, he learns the town's dark secret, and fulfills the promise he made to present a posthumous Congressional Medal of Honor for heroism to the farming father of a Japanese wartime buddy who had saved his life in World War II on the battlefields of Italy. 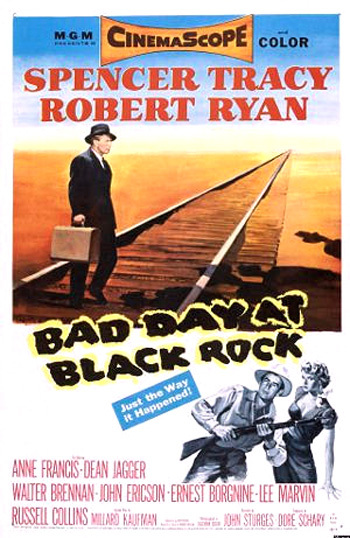 Bad Day at Black Rock was based on the short story "Bad Time at Hondo" by Howard Breslin and adapted by Don McGuire. The film serves as one of the first Hollywood statements about the racist treatment of Japanese-Americans during World War II - a group that suffered vicious prejudice and was forced into internment camps. The fictional small town of Black Rock (California) serves as a microcosm of America in the post-war era. There are only nine townsfolk in the film [the town's boss and his two enforcers, a brother and sister, a doctor, an alcoholic sheriff, the owner of the local eatery, and a telegraph agent] - some of them are cowardly hypocrites who feel threatened and want to maintain the status quo; others are noble individuals willing to risk their lives and restore civility and moral order to the town. The film, similar in many ways to High Noon (1952), even concludes with the inevitable Western-style final showdown. The film was nominated for three Academy Awards - Spencer Tracy was nominated for Best Actor, director John Sturges for Best Director, and Best Screenplay for Millard Kaufman. All three nominations lost to the Best Picture winning film of the year, Marty (1955). Coincidentally, Tracy lost the Best Actor Oscar to a costar in this film, Ernest Borgnine as a menacing thug, but in an Oscar-winning role as a homely bachelor. The score by Andre Previn brings effective reinforcement and emphasis to many of the film's melodramatic scenes. In the memorable opening scene on a warm day in 1945, the Streamliner diesel train - running on a single line of railroad track - ramrods its way across the Southwestern desert. Mr. Hastings (Russell Collins), a postal telegraph agent in a shack next to the tracks, rises from his rocking chair and reacts to the oncoming train with quizzical bewilderment: "Stopping...? Liz Wirth (Anne Francis), a young woman in jeans and a cotton shirt, stands inside of the door of the garage where she works and stares at the train. Others step out from dilapidated buildings along the town's single street in a dismal, forgotten town with sun-weathered, paint-peeling store fronts. They are silent and motionless - nevously cautious, slightly disturbed, and wondering why the train is coming to a complete stop - and violating their town. Conductor: Man, they look woebegone and far away. Macreedy: Oh, I'll only be here twenty-four hours. Conductor: In a place like this, it could be a lifetime. The stranger is immediately treated with suspicion and fear - entering from the outside, he represents a danger to the concealed town's citizens. Hastings is surprised to see the visitor - they haven't had a visitor in four years: "Nobody told me the train was stopping...It's the first time the Streamliner has stopped here in four years." [Symbolically, the guilty citizens of the forgotten town have bred concealment, and the dusty, uninviting, dying Black Rock has not had outside contact for many years. However, they are still linked to the rest of the world through the railroad.] Macreedy's destination is "Adobe Flat" - he must walk to the hotel in town: there are no cabs. With his suitcase in hand, Macreedy walks toward the remote town's sole street in the direction of the hotel. All eyes are glued upon the lone figure, as he strides along the wooden sidewalk. The telegraph agent phones an individual named "Pete" about the stranger's arrival. On the porch of the dusty hotel, the stranger is suspiciously confronted by Coley Trimble (Ernest Borgnine) and Hector David (Lee Marvin). Hector turns to Coley and alerts him to: "find Smith!" Well I know that, uh, ever since I got off the train, that everybody's been needlin' me. Why? Doc: He's no salesman, that's for sure. Unless he's peddlin' dynamite. Sam: Maybe he's a cop or somethin'. Doc: Ever see a cop with a stiff arm? Sam: Maybe his arm's all right. Maybe he's just hangin' onto something tight in his pocket. Doc: Like what? A pistol? A stick of TNT so he can blow up the whole mangy, miserable town. Macreedy leaves the hotel to walk toward the town's garage. Parked outside the hotel is a wood-paneled station wagon with a bloody, eight-point buck from a recent hunting trip strapped to the left front fender. The two men who emerge from the car are Coley and Reno Smith (Robert Ryan), the town's boss - they both watch Macreedy with a mixture of indifference and disdain. He grins at them and wearily mutters as he walks around them: "Here we go again." In the hotel's lobby, the townspeople speak about the "real cool guy" in town who isn't flustered by their intimidating, cold reception. Doc knows that Reno Smith and other xenophobic, uncooperative folks in town are protecting a town secret - and are worried about the intrusive, threatening one-armed man: "I was just wondering what all you people are worrying about...Not that I have the slightest idea...I hold no truck with silence. I've got nothing to hide...It's just that you worry about the stranger only if you look at him from a certain aspect." According to his perspective, Doc looks upon the intruder "with the innocence of a fresh-laid egg." Hastings joins the group and is ordered by Reno to investigate the man's background through Nick Gandi, a private detective at the Blake Hotel: "Send a wire to Nick Gandi in Los Angeles. Tell him to find out everything he can about John J. Macreedy...Tell him I want to know fast." Reno cautions his cohorts to calm themselves: "Don't get too nervous too fast, Hector...you're as jumpy as a stall horse...And while you wait I'll talk to him." Through the hotel's front window, they watch Macreedy approach the town's jail at the end of the street to speak to the sheriff. In the town's jail, the alcohol-guzzling Sheriff Tim Horn (Dean Jagger) is resting on a bunk in one of the two cells. Macreedy asks "for a little information" about how to get to Adobe Flat - he is looking for a man named Komoko. When he starts to ask questions while looking for Komoko, he is received with frightened suspicion. The majority of the citizens wish to keep their secret protected, conspiring against him with a code of silence. Without answering the question, the Sheriff reaches for his bottle and reacts with polite hostility: "If there are no further questions..." Macreedy walks from the jail down the dusty street back to the hotel. Hospitably, Reno Smith, owner of the Three-Bar Ranch, introduces himself and strikes up a friendly conversation. Smith: I want to apologize for some of the people in town. Macreedy: They act like they're sittin' on a keg. Smith: A keg...? Of what? Macreedy: I don't know. Diamonds? Gunpowder? Smith: (disarmingly) Oh, it's nothing like that. We're suspicious of strangers is all. Hangover from the old days. The Old West. Macreedy: I thought the tradition of the Old West was hospitality. Smith: (sincerely) I'm trying to be hospitable, Mr. Macreedy. You going to be around long? Macreedy: I was looking for a man named Komoko. Smith: Komoko, sure, I remember him, Japanese farmer. Never had a chance. Smith: He got here in '41, just before Pearl Harbor. Three months later, they shipped him off to a relocation center. Tough. Macreedy: You don't happen to remember which one they sent him to, do you? Smith: Who knows? Why don't you try writing him? I'd be glad to help you out. Macreedy: No, I'm afraid you'd be wasting your time. I've already written him but they don't forward my letters. They keep sending them back. Smith: You shouldn't have done that. Liz: I thought it would be better if he went out there and got done with it. What can he find out? I wouldn't do anything to hurt you, Reno, you know that. Smith: (He takes the ten dollar bill from her hand, crumples it, and pokes the wad back into her hand.) This is liable to be the hardest ten dollars you ever earned in your life. Smith: You don't know anything about Komoko, now do you, Tim? Sheriff: I do not. That's the point. Smith: The point is, what you don't know won't hurt you. Sheriff: Maybe there's something that I ought to know. Maybe there's something that I ought to ask you before the stranger comes back here and starts breathing down my neck. Smith: Tim! You're just a lost ball in the high weeds. I told you a long time ago, nothing happened for you to worry about. Sheriff: Thing is, I do worry. Maybe I ain't much else, but I'm sure a worrier. And I'm still the law. Smith: Then do your job, Tim. Sheriff: What is my job, Mr. Smith? Maybe I'd better find out before Macreedy does it for me. Smith: Macreedy'll do nothing - and neither will you, Tim. Sheriff: Suppose I decide to try? Smith: That might be dangerous. Tim, you got the body of a hippo but the brain of a rabbit. Now don't overtax it. Sheriff: (He lowers his eyes and looks away) Yes, Mr. Smith. Coley: I think Macreedy's a nothin', a nobody...So there's nothin' to worry about...What can he find out? That Komoko...Suppose he finds out. Pete: Why don't we wait?...I mean, maybe he won't find anything. Maybe he'll just go away. Smith: Not Macreedy. I know those maimed guys. Their minds get twisted. They put on hair-shirts and act like martyrs. All of 'em are do-gooders, freaks, troublemakers. Pete: Let's wait and see. There's no danger yet. Smith: (To Coley) No danger, he says. This guy's like a carrier of small pox. Since he's arrived, this town has a fever, an infection, and it's spreading. Pete opposes any talk of a hostile conspiracy to kill Macreedy: "You're mighty quick to kill - and he's not an animal." But they are all cowardly accomplices in the town's awful past secret and "it's too late" to run away. They must do something about the presence of the stranger with unclear motives.